Goldman Sachs wouldn't know how to act without deception, it appears. Goldman is quick to deny actions that it feels would ruin its reputation as it did when facing a civil fraud case (for which it had to pay $550 million in penalties), but it has never denied borrowing billions of dollars from the Federal Reserve, or come clean about the insolvency which would have led to such borrowings. GS has sold well over $100 Billion of MBS to the Fed since June 2009 -- $100,000,000,000 in (likely) toxic securities. These sales weren't reported at the time and still aren't reported in detail, i.e. at what price did the Fed purchase -- market or par. Clearly, the Fed has recapitalized GS by stealth -- if it hadn't been for the Discount Window borrowings and these MBS purchases (plus the AIG bailout and ZIRP) GS would be bankrupt. The MSM should be screaming about the injustice of this from the front page, every day. GS executives collecting tens of millions in bonuses when, if not for the taxpayer, they would be unemployed. 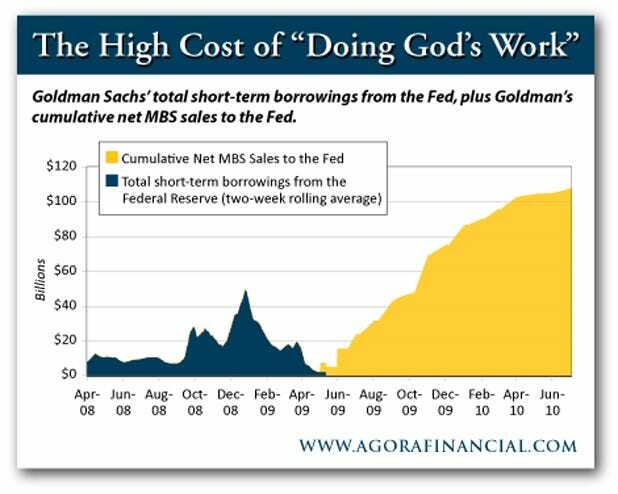 What is especially galling is that Goldman Sachs acts as though all the money they have accumulated for bonuses and pay was earned without any assistance from the Fed. Their faces should be emblazoned red with shame and embarrassment because of their use of taxpayers' money to contribute to their lavish and expensive lifestyles. Shame! Deception in the financial markets is not always costly, but it is rarely remunerative. Investors cannot afford to ignore this tendency. And the public never knew anything about these activities until two weeks ago, when the Fed was forced to reveal them. 1) Taxpayers have a right to know who’s spending their money. 2) Dollar-holders have a right to know who’s debasing their money. 3) Investors have a right to know who’s cheating them out of their money...by hiding the truth. Any thinking person reading the articles and comments on this site would realize something is not right...yet...people continue to ignore it. Such activities destroy the soul of humankind and play directly into the hands of the ruling elite that wish for you to be dumb, ignorant animals easily manipulated, corralled and sheared. There is a reason that plantation owners used to forbid slaves to learn how to read and write. They understood that an ignorant person is much less likely to resist their enslavement. The same is true in America today, where an unthinking and DEPENDENT person is unlikely to resist. There is absolutely zero doubt in my mind of one thing. That we are in what Neil Howe and William Strauss dub “The Fourth Turning,” which represent periods where the prior status quo is completely ended and something new emerges from the ashes. This means that despite the best efforts of the Washington D.C./Wall Street TBTF oligarchy the monetary system is on its last legs and something new will replace it. Unfortunately for us, the leadership in these areas are so filled with greed and arrogance they cannot see what is right in front of their eyes. Or those that do see it care so little about the future of the country relative to their personal social status that they dare not speak up. The universe will have its way with these folks. eToys $500 million lawsuit against Goldman Sachs dismissed without a trial in NY Sup Ct a few weeks back and NO paper reported it. Now Goldman Sachs is also found Not Guilty without a trial in Madoff case. A New Jersey federal judge found last week that a Bernard Madoff Fund investor had failed to make a case that bad advice from Goldman Sachs led him to lose $15 million.